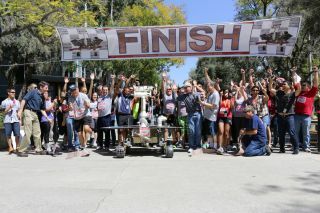 Runners at NASA's Jet Propulsion Laboratory cheer as a test model of the Mars rover Opportunity ceremonially crosses the finish line after a relay marathon to mark the rover surpassing the distance of a marathon race on the red planet. NASA's Opportunity rover recently completed a historic marathon on Mars, so folks at the robot's home base ran a race of their own to celebrate. About 90 employees of NASA's Jet Propulsion Laboratory (JPL) in Pasadena, California, which manages the space agency's Mars rover projects, ran a marathon-length relay around the facility's grounds on Thursday (April 9), NASA officials said. You can watch highlights of the marathon relay in a new video, courtesy of JPL. The Opportunity rover was there in spirit: A test model of the rover broke the finish-line tape after the human runners were done. Opportunity and its twin, Spirit, landed on Mars three weeks apart in January 2004, and were tasked with three-month missions to search for signs of past water activity on the Red Planet. Both six-wheeled robots found plenty of such evidence, and then kept exploring for years after their warranties expired. Spirit was declared dead in 2011; Opportunity is still rolling along today, though it has been experiencing some problems with its flash memory — the kind that can store data when the power is off. On March 20, Opportunity's handlers uploaded new flight software intended to fix the flash-memory issues. But the rover experienced another brief bout of amnesia five days later. Last year, Opportunity broke the distance record for off-planet driving, surpassing the 24.2 miles (39 kilometers) that the Soviet Union's Lunokhod 2 rover covered on the moon back in 1973. And last month, Opportunity's odometer ticked past 26.219 miles (42.195 km) — the official length of a marathon race. "This is not the finish line for the rover, but merely just another milepost in its tremendous accomplishments of exploration and discovery on Mars," Opportunity project manager John Callas, of JPL, said in the new video. Opportunity has been exploring the rim of the 14-mile-wide (22 km) Endeavour Crater since August 2011.